Eric Larson was without question one of the most extraordinarily gifted, charismatic and influential recording engineers and producers of the 21st century and he lived right here in New Mexico. His career covered decades and included work on and credits for a 2003 Grammy Award winning album. He was the mastering engineer for he album project "Flying Free" by Black Eagle, the Jemez Pueblo drum group who earned a 2003 Grammy for Best Native American Music Album. Eric helped found the New Mexico Music Industry Coalition which evolved into the New Mexico Music Industry Association and through it created the "MIC" Awards, now called the New Mexico Music Awards, to honor New Mexico music recording artists. Eric would later become an adjunct faculty member at UNM. He taught the most sought after recording courses ever for the music department and an advanced digital course. Eric's recording classes were so popular and in such demand that there were waiting lists for multiple semesters in advance. 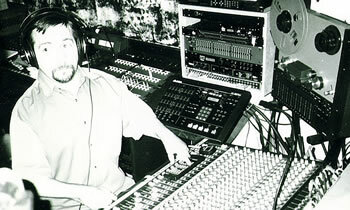 As well as an extraordinary freelance engineer and producer, Eric was a composer. He wrote compositions ranging from classical to contemporary. He also served as music director at his church. His talent touched everything from advertising jingles, to rock 'n' roll, jazz, to classical music including the New Mexico Symphony Orchestra, Native American music and acoustic and flamenco guitar recordings. One of his most exceptional qualities was his amazing ability to reach into the very heart and soul of the artists he worked with and to capture the very essence of their artistic abilities. The results of his efforts in the final product were always extraordinary. In many respects, Eric Larson helped to shape the recording and music industry in New Mexico into what it is today. Thanks to Eric's many contributions to the NM music industry, there is a thriving annual music awards event through the NMMIA and his course curriculum continues to be taught at UNM. Most importantly, his legacy lives on through the many artists, composers and recording engineers he mentored and produced. You can experience this for yourself and hear some of Eric's best recording achievements by purchasing the newly released tribute CD album, "For A Life"here. 100% of the proceeds of this album go towards the scholarship established at the University of New Mexico Fine Arts Department.